"C'mon then! If you fink yer canard enough!" 2 An extra surface attached to an aircraft, hydrofoil, etc., for stability or control. Ducks are impossible not to like. They're beautiful, friendly, sociable, damn cute and, with a splash of plum sauce, delicious. They're also funny. In fact, the duck has been identified as the world's funniest animal by psychologist Richard "Nothing Better to Do" Wiseman. After a year of study, Wiseman reported: "If you're going to tell a joke about any animal, make it a duck." Brilliant. Keep the phone line clear for the Nobel Prize Committee, Richard. For all its admirable qualities, however, the duck, by way of the French canard, has entered English meaning 'a hoax'. Its route of entry isn't completely clear, but several sources suggest that it's via the French expression vendre un canard à moitié, which means 'to sell half a duck'. 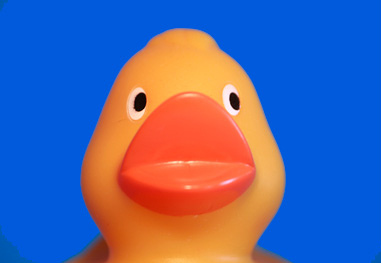 The exact nature of the swindle (or hoax) is uncertain - perhaps it is just selling someone half a duck when they really, really needed a whole one for their duck a l'orange. If that's the case, that's a stupendously unimaginative hoaxer, and a spectacularly stupid chef. Despite this, it's the canard that gets landed with the reputation. A fictional conspiracy theory that millions of duck eggs were being illegally gathered from protected areas in Alaska for the purpose of harvesting albumen. In 1986, a supposedly gigantic duck was reported to be attacking and killing wildlife, including small dogs, along the Thames River in Henley. Such was the panic that the local police advised that children should not play unattended near any bodies of water. In 1994, reports emerged that North Korean scientists had successfully bred a duck with a duck-billed platypus, dubbed the "duckypus" in Western media (a joke that is apparently lost in Korean). The purpose of such a breeding programme was never made clear, and while it's generally assumed to have been a hoax, no official denial was ever issued by the secretive communist state. 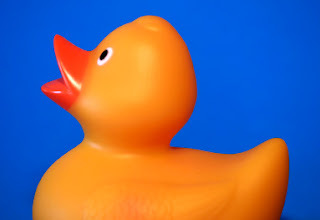 A duck's quack doesn't echo. Were you ever told that? It's a canard, and so are you for believing it. Eager to blame bankers for the Global Crash of 2008, a story circulated on the internet that it was precipitated by a Wall Street banker investing billions into the Chinese duck-meat substitute mock duck, the value of which promptly plummeted (presumably when people tasted it), thus plunging the US into recession while giving China a cash injection that has funded its growth to this day. The banker concerned was dubbed The Mock Duck Stock Schmuck, but it's all untrue, every last bit of it. Well, except the bit about bankers being to blame for the global economic crash. Have you ever fallen for a canard? 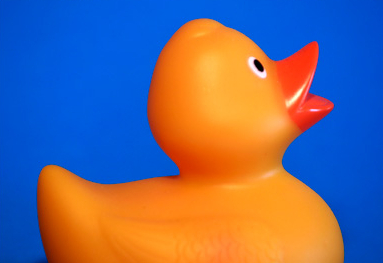 Do you know of any other duck-related scams or hoaxes? Do please paddle your plummiest comments in the comment box below. Sorry I haven't commented for a while ed - I was in the bathroom. I heard that baby ducks (les petites-pois canardes) burp in c-major so consistently that the Orchestra of Paris (la orchidée d'Paris) uses one to tune most of their string section (la secte de corde à sauter). Good to see you, C. That's very interesting about the Paris orchestra ... although we're really looking for duck-related hoaxes here, not hard facts, like that clearly is. Apparently in the mid 50s the town council in Pamplona introduced a yearly event for the under 6s called "The Running of the Ducks". After bringing in huge numbers of ducks for the event, the authorities were informed that ducks only rarely run, usually pottering around at a brisk waddle. This led to extensive studies to determine what would best provoke them to run at the required intensity. These studies found that the most effective way to make ducks run at full speed is to have them chased by bulls, so the ducks were released into the wild. Once again, it's ducky hoaxes we're after, not stories that are patently true, as this one is clearly is.